It began at the temples. Over the head, face and chest. On my forearm, in ones and twos. 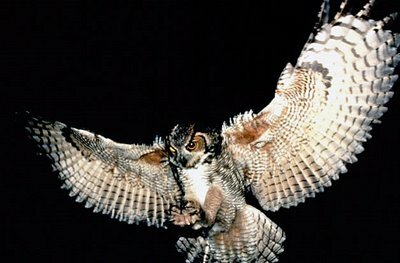 On the wings of the Great Horned Owl. In Malayalam, the Mottled Wood Owl is called 'Kalankozhi. The owl's eerie calls in the nights scared people - they associate the bird with death - hence Kalan-Yama, lord of death; kozhi - here, a bird. I took the liberty of using Great Horned Owl - in the picture and the poem - just because that is a grander bird, in size and name! The ageing process is strange, as kids we are in a hurry to grow up, as adults we want to retire and live a life of peace, away from the rat race, and when we are finally over 50, i think we start to really worry, about age and the slowing down, and all the other things age can bring forth. Its not death that scares me, as muchg as the pointless existence before, death reaches me! i don't know whether there is something wrong with me, balan. at 20, i thought 30 middle age, at 30 it became 40 and at 40 it changed to 50. now at 53, i find 65 or so will be the time when the middle age actually starts. it is only when some nice young girl calls me uncle that i jolt. soon they will start calling one gradpapapa too. curse them! but your poem is very good, as always. As Sujata has pointed even I was always in a hurry to grow up soon to be independent to take my own decisions and to kind of reduce the invasion in my privacy. But now since I've achieved that I feel my childhood was better. I want to play games with my niece just like a kid..! May be I am too scared to even think about getting old..! @venugopal: Lucky you!At 52, I am feeling like 82! You are too young to be writing such depressing things about death and dying and death seeking you out and all..
About growing up , i am only 22 , but i miss my old self , like i was , maybe 5 r 6 years back. I was such an innocent girl..Now i am a little bot suspicious , a little more cynical , a little more shrewd. I didnt even know what hate was , now i know. I am becoming so much of an adult and i hate it. I miss those nice days of innocence. If growing up is at the cost of losing all the nice things in you , and getting so much of bitterness inside you...i'd rather not go beyond 22. @gymnast: That at times I write about age and death ( maybe too often!) does not necessarily mean that I am always depressed. I am going through an unhappy phase - read tired. But I am sure it will pass - it has to. Listen, just 2 years back I rode a bike all the way to Khardung La in Ladhakh - I was the oldest rider in the group of nearly 50 riders; isn't it proof enough I am undaunted? Life is full of such ups and downs, pardon the cliche'. Even at 22, I had my bad days and good days. But let me tell you, yours is the best age! To be young, independent, healthy! How I would love to be back at 22! I write about such things lest myself and my readers do not forget how precious life is - the contrary effect is not intended. Death can strike anytime, but when you are young, such thoughts are remote! DO read the blog post I recommended above and you will understand. To be aware of ageing and death is to respect and love life - all the more! Cheer UP!